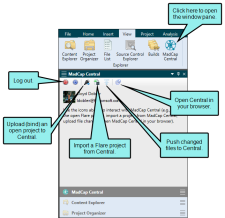 MadCap Central's integration with MadCap Flare lets you store copies of your projects in Central, continue to work on them locally in Flare, and keep both sets of copies in sync. 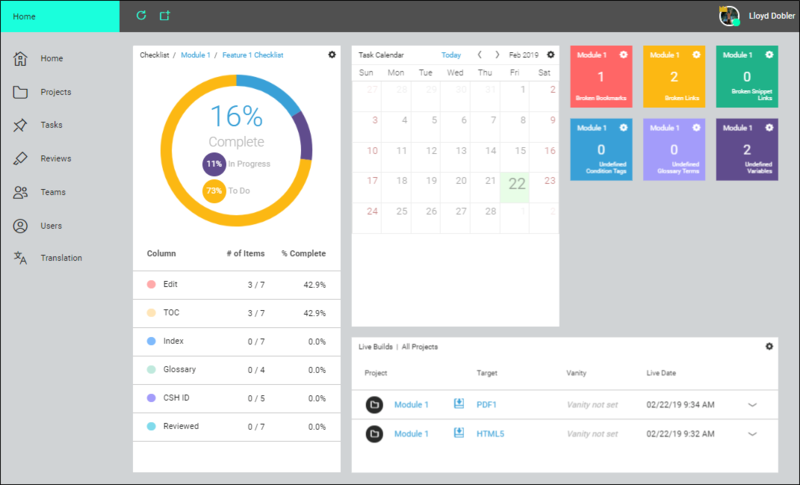 You can use Central to quickly build and publish output (and roll back when necessary) without the need to involve an IT department. You can also send topics and snippets for review on Central, as well as use custom checklists to track your progress in Flare projects. 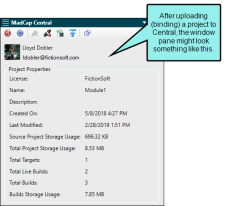 The MadCap Central window pane in Flare lets you upload (bind) and import projects, as well as push project changes to Central. Additionally, you can see project properties, log in and out of your Central account, and launch the Central portal in your browser. Log In and Log Out If you have an account in Central, you are able to log in and out of your account from Flare. When you are logged in, you are able to access project properties, upload (bind) and import projects, and push project changes to the cloud. See Logging In and Out of Central in Flare. Uploading (Binding) Projects You can upload a project to Central from the desktop Flare application. A copy of the project will therefore reside in the cloud via Central, and you will be able to keep the local and cloud versions of the project synchronized using integrated source control. You will also be able to generate and publish Flare targets using Central. See Uploading (Binding) Projects. Importing Projects If another user uploads a Flare project to your MadCap Central license and you do not yet have that project on your computer, you can import it. See Importing Projects from Central. Committing and Synchronizing (Pull, Push) in Single-bound Model If you are working in a single-bound model, you author content in Flare. When you want to transfer your changes to Central, you use the Source Control ribbon to commit files that you’ve changed. This gives you the opportunity to organize your files into different groups when you add them to Central, and to add a comment to each commit as well. After this, you synchronize (pull, push) your changes with the cloned project on Central. See Committing and Synchronizing (Pull, Push) in a Single-bound Model. Pushing in Dual-bound Model If you are working in a dual-bound model, you author content in Flare and use your third-party source control tool to synchronize your files with those from other writers. After this, you use Flare to push those changes to Central. See Pushing in a Dual-bound Model. 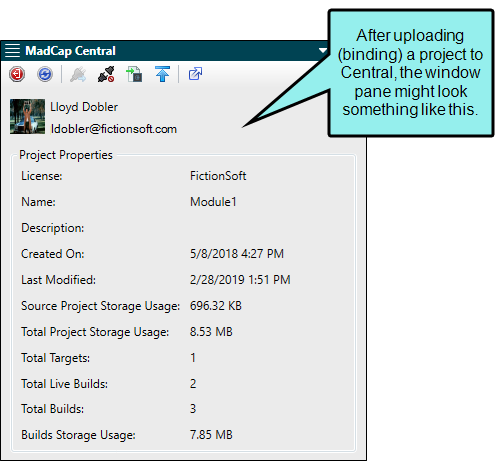 Viewing Project Properties If you have access to a project in Central (i.e., you have been added to the project), you can view its properties in the MadCap Central window pane. This lets you see relevant information about the project, such as when it was added to Central, the amount of space it is using on Central, and the number of targets and builds. See Viewing Project Properties. Removing Bindings If you no longer need your project to be bound to Central, you can remove its binding. Removing the binding from a project does not remove that project from Central; instead, it simply removes the link between Central and your local project. The project will still be available locally, but you will no longer be able to upload (push) changes from your local project to the cloned project on Central. See Removing Bindings from Projects. Send for Review The Central review process lets you send Flare topics and snippets to be reviewed by subject matter experts (SMEs) or other Flare authors on MadCap Central. After making edits and adding annotations (comments) to the files in a lightweight editor on Central, the reviewers submit the finished files, sending them back to your inbox in Flare. You can then accept or reject their changes and accept the file, replacing the original source file. Because this system uses the cloud, SMEs do not need to download any software to review your files. Also, multiple reviewers can edit the same file at the same time. See Sending Files for Review on Central. When you upload a Flare project to Central, the files are connected to Central via an integrated source control system. Your interaction with source control can follow one of two models—single-bound or dual-bound. Single-bound projects are not bound to an additional third-party source control provider; they only use Central's source control system. Dual-bound projects, on the other hand, are already bound to another source control provider, and therefore are bound to both the original third-party source control provider and to Central. See Source Control and MadCap Central. Security and privacy are top priorities at MadCap Software, especially when providing customers with a cloud-based system in Central. We are committed to keeping your files, data, and communications secure. Therefore, in choosing Microsoft® Azure as a partner, we focused on selecting a security center that understands the importance of privacy and complies with the highest international and industry-specific compliance standards and uptime guarantees. Microsoft Azure regularly undergoes rigorous third-party audits to ensure and verify the highest level of security controls. Also see Security and MadCap Central. Note: At this time, you cannot perform source control tasks from the Central interface. This can be done only from the Flare project. Note: Certain Flare features are not supported when generating output from Central. This includes limitations on which output formats can be viewed from Central. See Flare Features Not Supported in MadCap Central.